Some of the newly arrived settlers formed a church that first met in a schoolhouse with Rev. Edward Rees as their pastor. Later the meetings were held in a schoolhouse on Sand Bank Road where Rev. John D. Jones ministered. By 1854, the church was regularly organized by Rev. James Lamb with about thirty members. 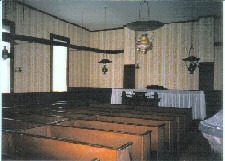 The church edifice was erected in 1855 at a cost of $900.00 with a seating capacity for 250 people. The Greek Revival style church with eight shuttered windows and double entrance doors sits on a foundation of rectangular stones. The interior consists of an entry hall with doors leading to each side of the sanctuary. A large window gives light from the sanctuary. Two cast iron wood stoves, with stove pipes suspended from the ceiling, provided heat and hanging oil lamps provided light. Wooden box pews and kneelers filled the sanctuary's center and sides. An Estey pump organ accompanied the singing. A large pulpit and choir area filled the front of the sanctuary on a raised platform. The congregational affiliation was Welsh Calvanistic Methodist until 1892 when the Calvanistic Methodists became Presbyterian. The name of Salem was used extensively in Wales to designate a place of worship and according to the Bible dictionary, its meaning is "peace". SALEM, in painted block letters, was placed over the front doors and the church became known as Salem Presbyterian. The little church was both a place to worship and a place for the community to meet socially for readings, meetings and song-fests called gymanfa ganu. The first two children baptized in the church were David W. Davis and David Hooper about 1855 and the last baptism was of David Jones in 1899. On July 14, 2001, Rev. Canon W. David C. Thomas, an Anglican priest from Wales, officiated in the baptism of Maria Bronwen Ziaja, daughter of Artur Ziaja and Elizabeth Giles. Time passed and by the early 1900's, the older congregation was dying away and the younger generation had either left the community or were attending churches using the English language. The church slept in quiet peace until 1926, when Dr. Albert and Mattie Evans approached Trustee Lewis Jones and arranged to have the cemetery mowed and trimmed and the church re-opened for a memorial service. This service was so popular that plans were made to conduct a memorial service every year and use the offerings collected for the upkeep of the church and cemetery now called the "Little Park of Memory". Sons and daughters of Welsh ancestry could once again come and worship, renew acquaintances and sing the beloved old hymns with the white-robed choir. The church and choir were all dressed in white and the service became known as the White Service. In later years, two weddings were performed in the church when Lynda Williams married Russell Tucker in 1959 and Lon Owens married Tami Andera in 1998. On May 28, 2011, another ceremony wed Honi Deutsch and John Chassin. 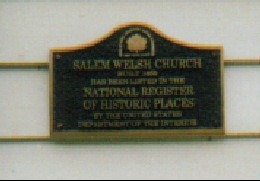 In 1975, the church was deeded to the Salem Cemetery Society by the Welsh Calvinistic Methodist Church Society called Salem. While remaining in its untouched glory, the church has been maintained with loving care as necessary repairs have been done. 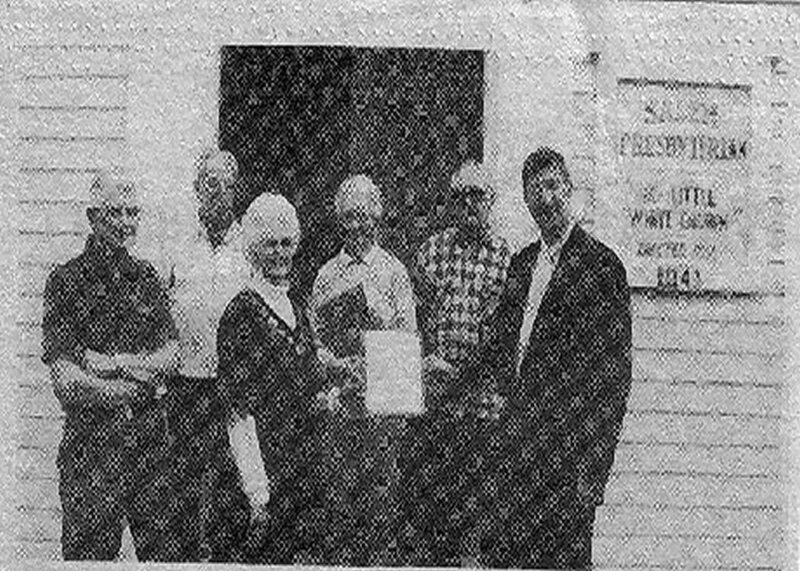 By the mid 1990's, an application for historic status was written by Barbara Henry in order to preserve the property. The church was placed on the State Register of Historic Places on July 26, 1995 and the National Register of Historic Places on September 7, 1995. A bronze plaque was purchased with a donation from Welsh descendant Jane (nee Quackenbush) and Frank Emanuel and placed at the left of the entrance doors. 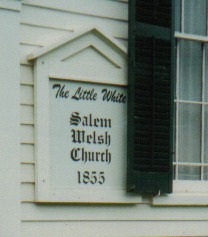 The sign on the right of the entrance doors now reads "The Little White Salem Welsh Church 1855". Although seating capacity was 250 people at the time the church was built, people have become larger and the church can now seat about 125 people comfortably. The church has had the foundation stones reset, the roof reshingled and a new coat of paint applied in recent years. The shutters have been replicated to protect the fragile windows from damage. There were several Welsh churches in the area, but today the only one still standing is Salem Welsh Church. © 2016 Salem Cemetery Society, Inc.